Following up on my recent post about making a minimal VPN routing virtual machine to isolate obnoxious VPN clients, another problem you’ll run into if you have the need to connect to a whole lot of client networks is that the networks of different companies tend to overlap, either with your own or with eachother. Most companies I deal with use the 10.0.0.0/8 or the 172.16.0.0/12 networks, as specified in RFC1918, or some combination thereof. 192.168.0.0/16 seems to be really unpopular for some reason, even in small networks. The problems arise when one client’s network fully or partially overlaps that of another client, or that of the company you’re at. If there’s a 10.10.1.50 host in your network, and 10.10.1.50 is also inside the client’s 10.10.0.0/16 network, pfSense would have no idea where to route you. We could make a rule to route single computers to the remote site, but then they could never access the local machine with that IP. What we need is remapping, translation, dirty outbound NAT hacks and a bit of black magic. This diagram attempts to show the address translation accomplished by pfSense and the reflector VM. The idea is to map the machines we’re trying to access at the remote site to an address range that is unused in the local network. Currently, we do this on an IP by IP basis, but it could easily be extended to translate entire address ranges if desired. Image created with draw.io (XML). The reflector VM didn’t need an IP address this odd, but it has yet to collide with a client, so that’s nice. 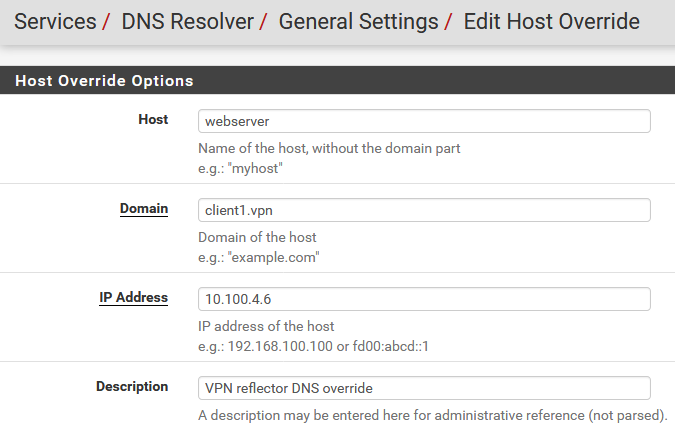 pfSense receives the connection request from 172.31.255.1 to 10.2.4.2, knows that 172.31.255.1/32 is the local IP range for the VPN connection to Client1 and routes the connection over there. ..but why would you want to use the reflector to connect to anything local? Glad you asked. Keep reading. Firstly, we configure the VPN connection in pfSense as usual. Let’s assume it’s IPsec to make it easy. We set the local network to 172.31.255.1/32, and use NAT/BINAT translation to set the address to anything not in the client’s network, which will work just fine. 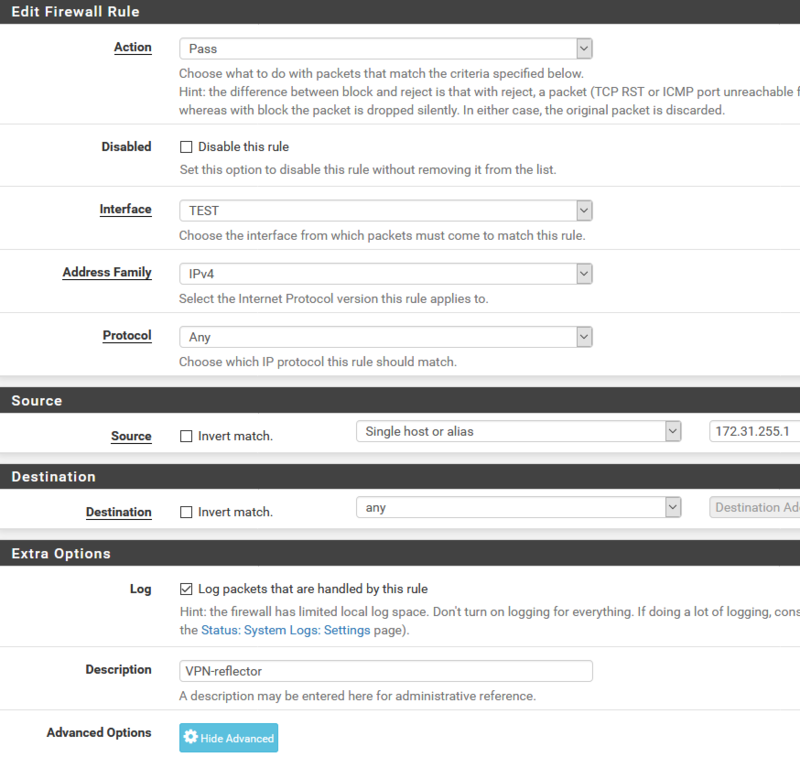 The screenshot shows the IPSec Phase 2 configuration. 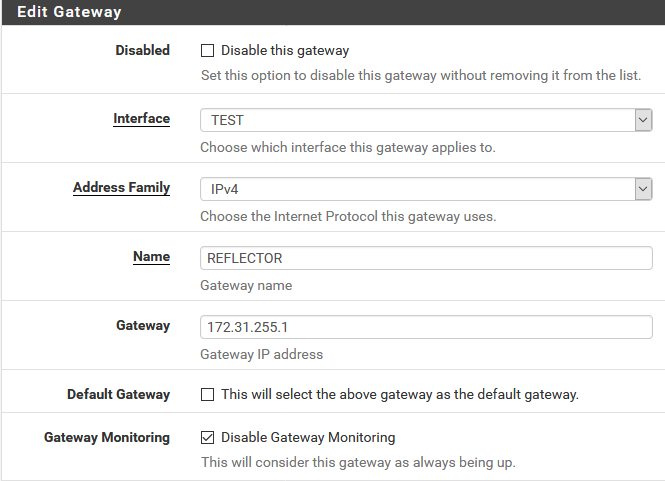 Next, we add the Reflector VM as a router on our internal network. We also need to add a static route to send everything going to the 10.100.0.0/16 network to the router we just created. 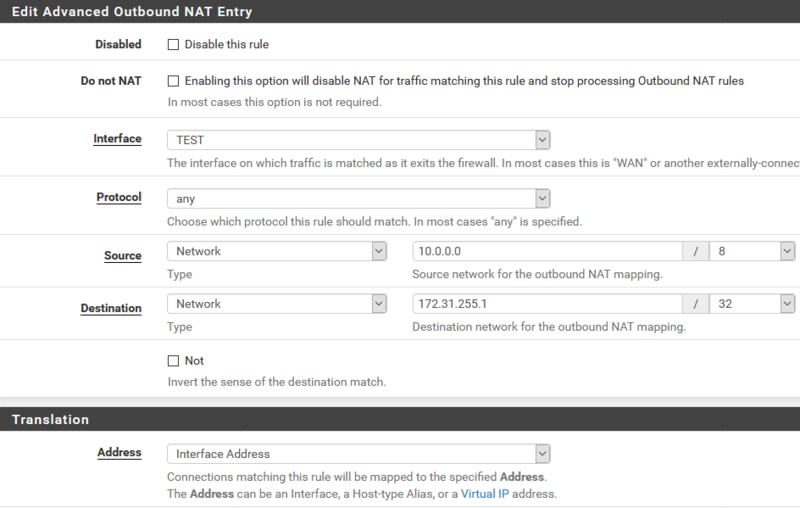 Then there’s the outbound NAT that translates requests going to the reflector as coming from pfSense. What we’re saying here is that connection requests going out of the TEST interface from any internal IP (I made this /8 just so I don’t have to touch it again) and heading to 172.31.255.1 should be NAT’ed to the interface IP of pfSense. Then we add the firewall rules. We need two of these. 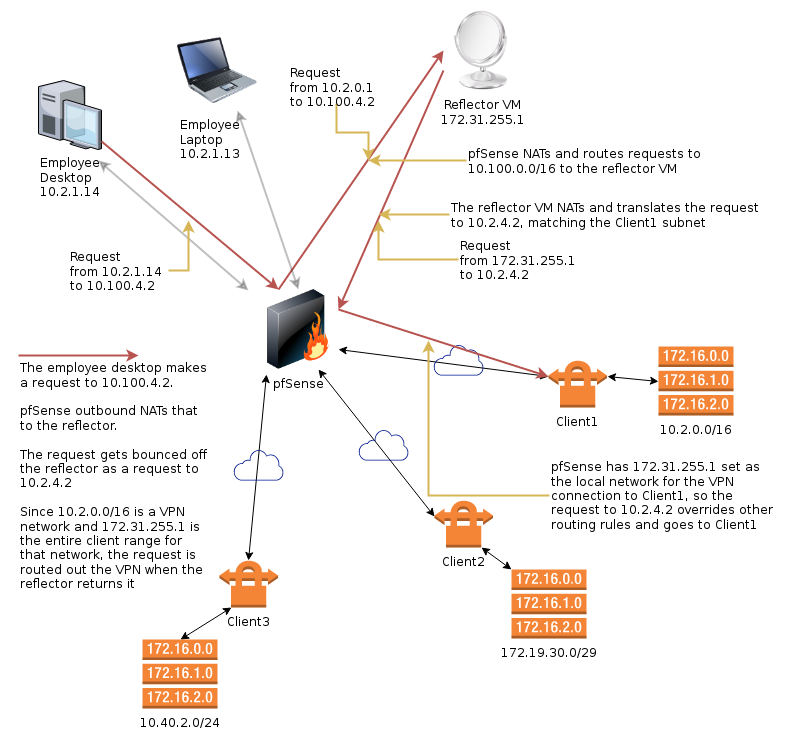 The first one allows the Reflector VM to connect to all networks, which includes all the remote clients. The second (not shown, but you’ll figure it out) allows the local machines to connect to the 10.100.0.0/16 network. This concludes the pfSense side of things. The reflector is a minimal install of Debian Linux with Shorewall installed. I’m familiar with both, so that makes it an obvious and time saving choice for me. First, there’s the interfaces file. Just the single network interfaces in here. Not much to see, but the routeback option is needed to allow traffic to ingress and egress the same interface. The zones file is equally dull. At the policy file, it gets a bit more interesting, as we allow any traffic to bounce off of us, going from net to net. Then come the rules. This is where we do the mapping. These are mock entries to preserve company privacy. Note the single reverse connection too, which allows companies at the remote end to reach a local webserver. With our IP addresses re-mapped for the clients, everything should, amazingly, work. It’s not pretty. Far from it. But it does the job, it’s stable, and all I need to change to accommodate a new client is adding the map in the rules file after setting up the VPN. The addresses in the 10.100.0.0/16 range are completely arbitrary. I usually make the last 8 bits match the client’s machines, but you don’t have to do that. Finally back to pfSense again, I also have some DNS host overrides so employees don’t have to remember the remapped, or the original, IP addresses. Note that if you’re dealing with HTTPS and want certificates to function correctly, the host.domain names need to match the certificates on the remote servers. These overrides are trivial to set up, but here’s an example anyway. So what happens when two clients overlap with each other? The above solution applies when clients partially or fully overlap your internal network. 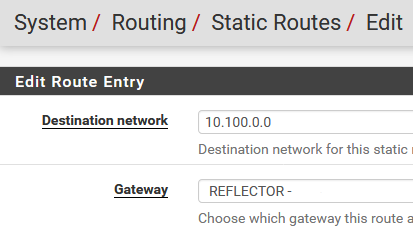 However, if they overlap with each other, pfSense would again not know where to route a given connection from the reflector. The solution then is another reflector VM. They’re very cheap to run anyway, so it’s not a big issue.